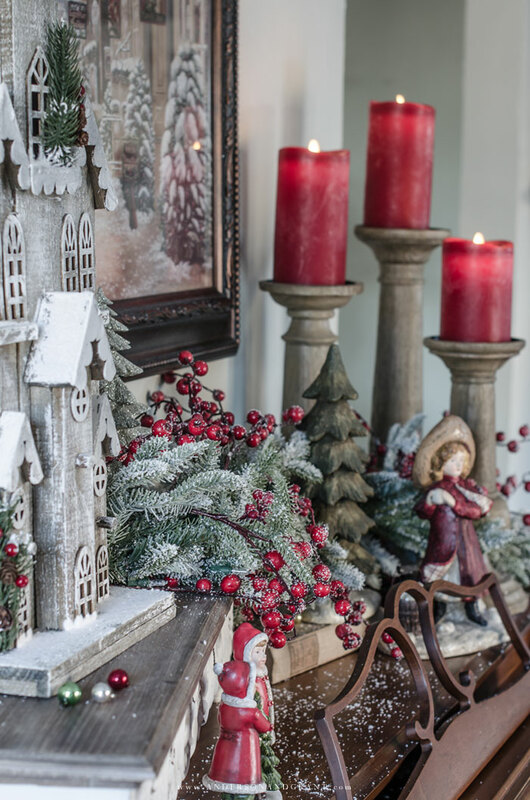 Decorating your home is another way people put extra effort into this season. 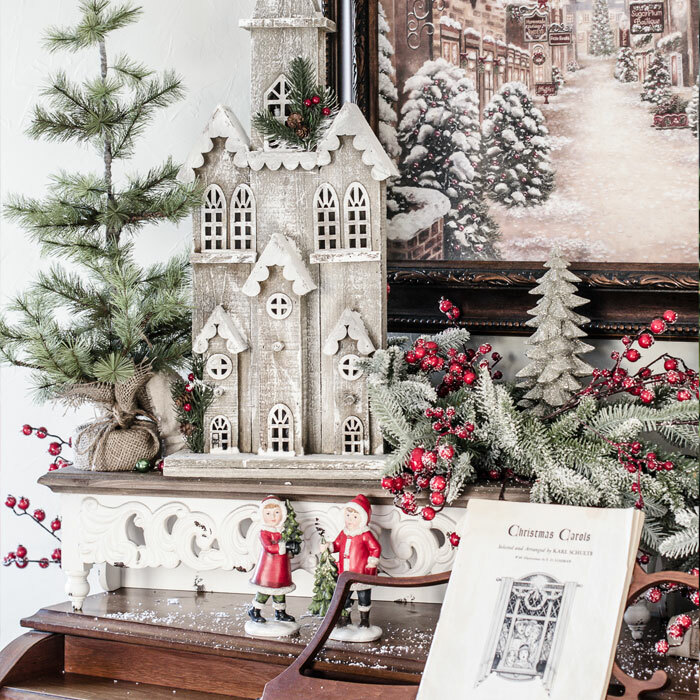 Even those who don't enjoy displaying a lot in their house or shopping for home decor find themselves taking the time to add at least a small festive touch to celebrate. 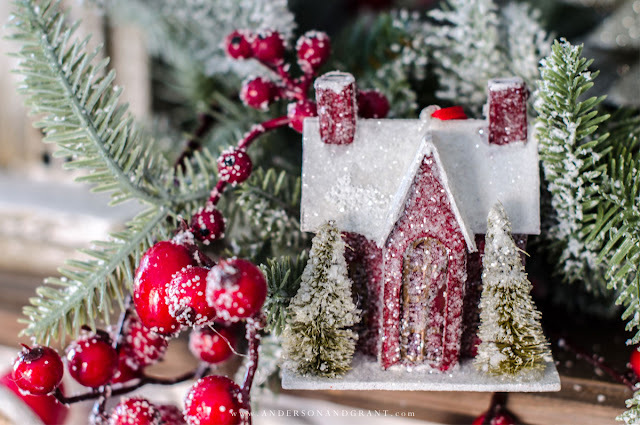 Regardless of your style, the size of your home, or your budget, it is possible to add a little Christmas cheer to wherever it is that you reside. 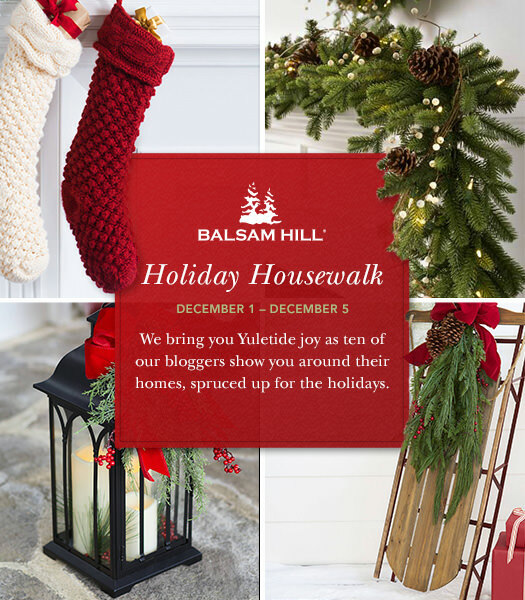 Today I have the honor of partnering with Balsam Hill as part of their Holiday Housewalk. 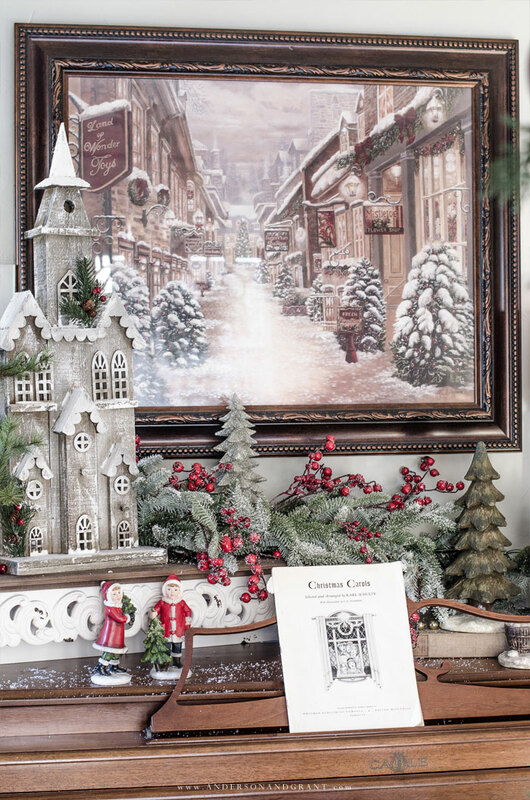 Since Friday, a total of 10 of us have been sharing a view of our homes all decked out for the season. I'm sharing today with Taryn Whiteaker and links to all the ladies participating appear near the end of this post. Some links in this post are affiliate links which means I make a small commission if you purchase something, but your price stays the same. You can view my disclosure policy here. 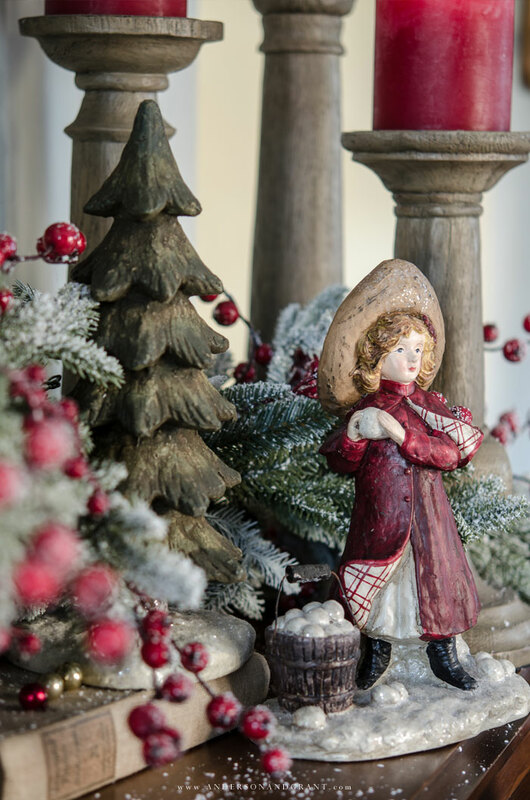 As much as we focus on decorating the inside of our homes for Christmas, I think it is just as important to pay a little attention to the outside as well. There are likely more guests visiting your house and more people driving around your neighborhood to see people's lights and decor. 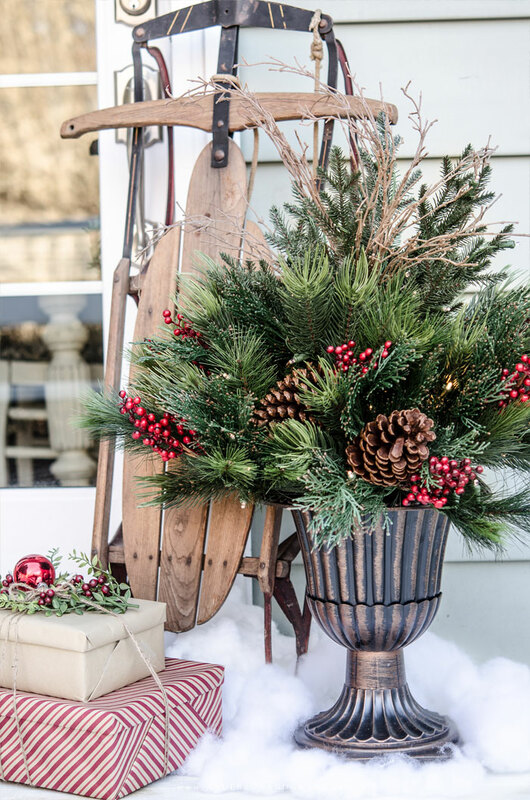 It isn't necessary to do a lot, but something as simple as a small tree in a pot or garland around your door brings the holiday to your entry. 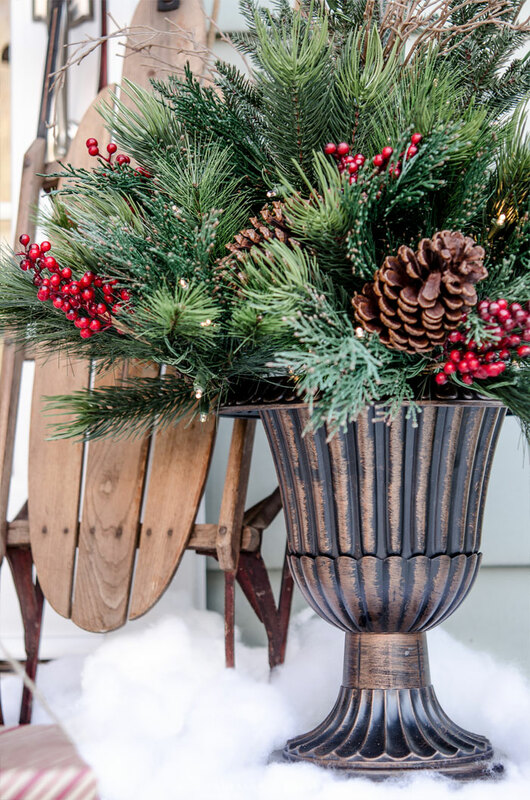 This urn planter full of faux greenery, berries, pine cones, and lights can be taken right out of the box and after fluffing the branches just a bit, you're done and your porch is decorated! I love displaying old wood sleds and being transported back to a simpler time when these would have been used by children riding together down a neighborhood hill. There is something really special about things from the past like this. The look can't compare with those brightly colored plastic varieties we have now! Inside the home, I like to find unique ways to display the things I have. 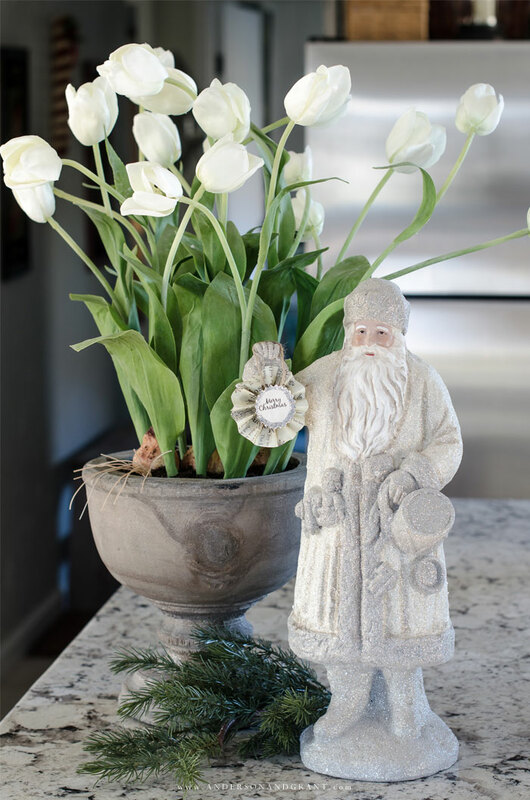 Part of the fun of decorating is finding different ways to show your favorite treasures. 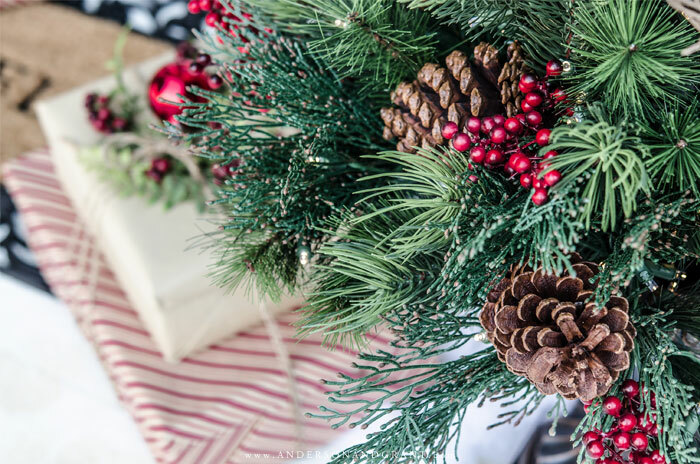 And as much as I love neutrals, there is something so beautiful about seeing pops of red against the vibrant greens of trees, garlands, and wreaths at Christmas. 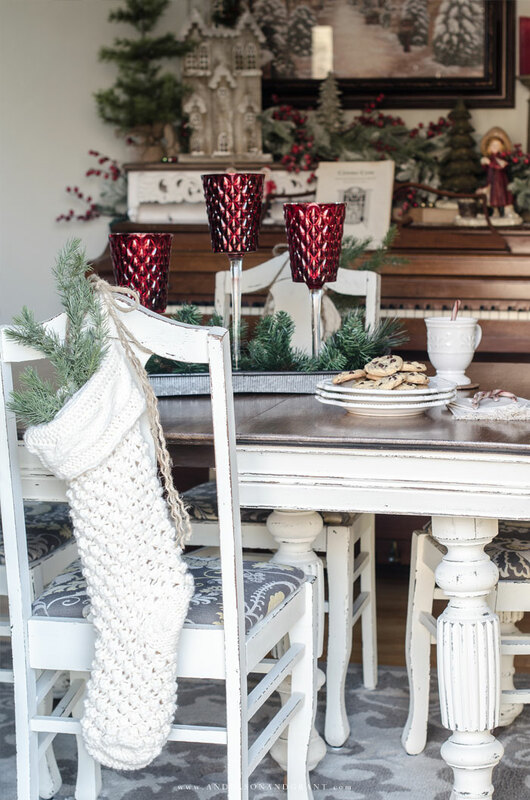 While you'd normally see stockings hung from a mantel or down the stair railing, I chose to adorn the back of dining chairs with these chunky knit stockings filled with realistic looking greenery. They are tied onto the top with a bow using heavy jute twine. I like a rustic look, but if you have a more classic style, you could also use white ribbon. 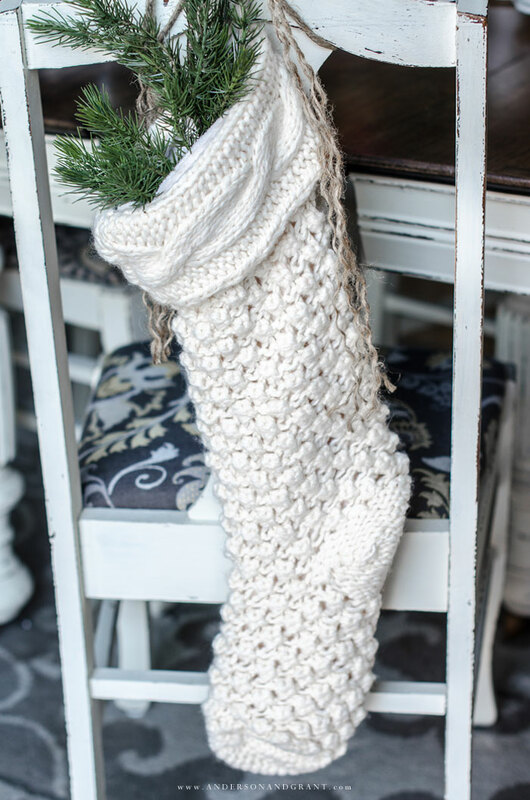 Some other ideas could be to fill the stocking with berries or tie an ornament or glittered monogram to the top of the stocking. In the center of the table is a long metal tray filled with greenery and red mercury glass candleholders purchased a Michaels a few years ago. It is easy to take this off the table for dinner or when spreading everything out to work on addressing holiday cards. You don't want to spend time putting together a beautiful display that you'll have to move piece by piece each time you need to use the table. The large picture hanging on the wall serves as both a focal point for the room as well as the inspiration for my decorating theme. Again, it reminds me of days gone by when Christmas was likely less hectic and you would be shopping in small locally owned shops rather than malls and big box stores. 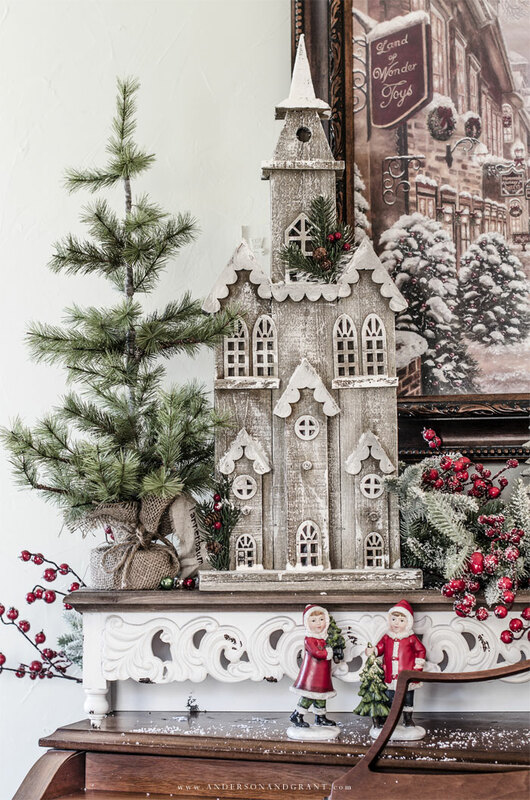 The snowy scene inspired me to include a rustic wood church that you may see further down the road in this picturesque village. 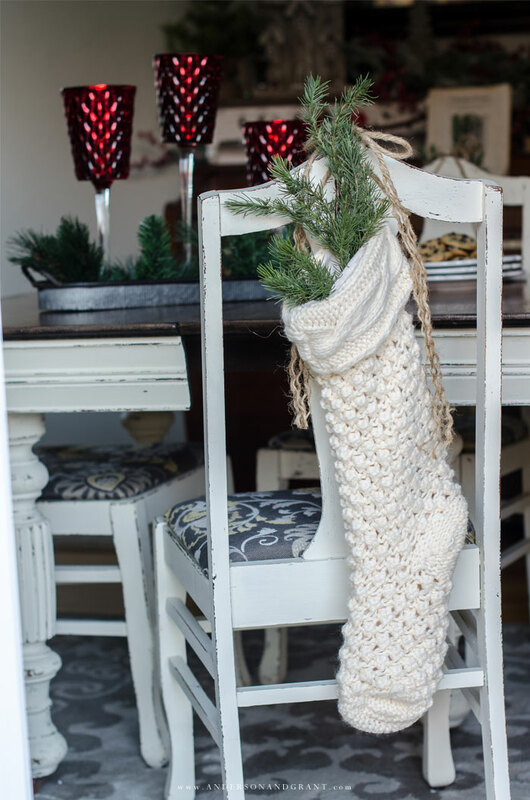 It is resting on a distressed white shelf that you'd typically hang on the wall. But I love the beautiful scroll work and have used it as an accent to boost the church up off the piano. Creating different layers and levels in your displays keeps everything from looking boring. 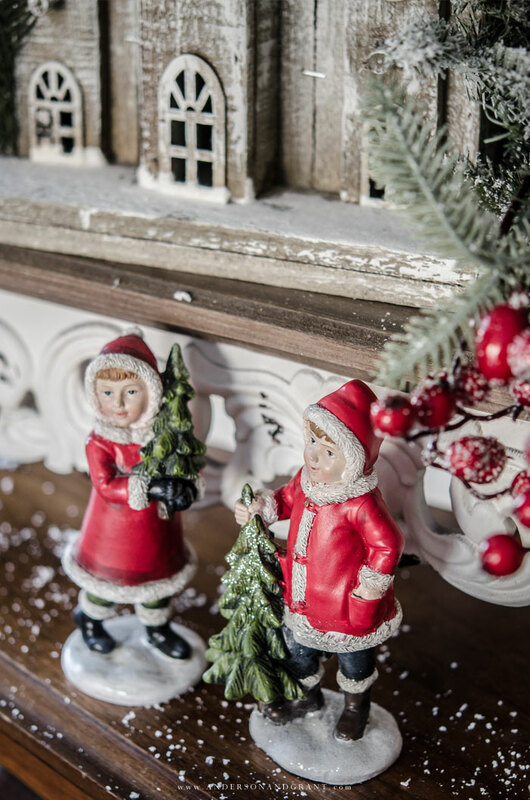 A sweet little boy and girl dressed in red add a pop of color in front of the shelf. On the other side of the piano is a vintage looking girl ready to throw some snowballs in the streets of the town. 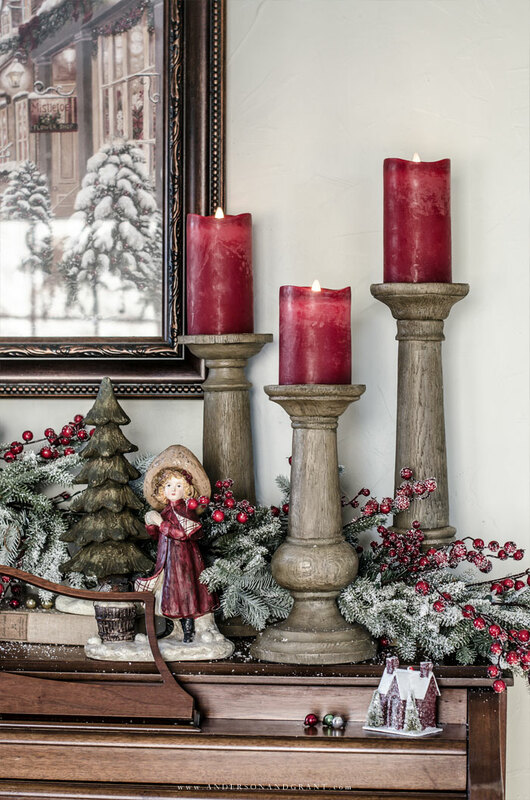 She stands next to a trio of chunky faux bois candlesticks that balance out the height and scale of the church on the other side. 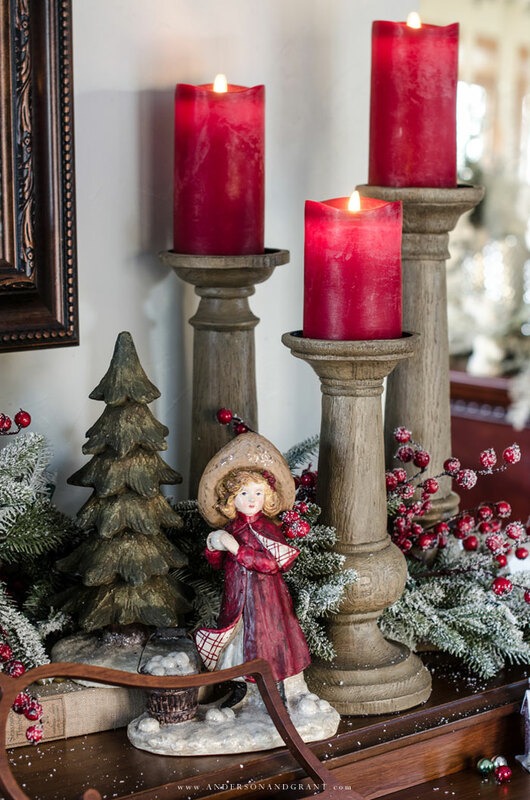 Three Miracle Flame candles add another pop of red. White lights and flickering candles are a must in my home at Christmas. There is a remote for these candles that allows me to turn them on and off and control the flame's speed and brightness for a really realistic look. 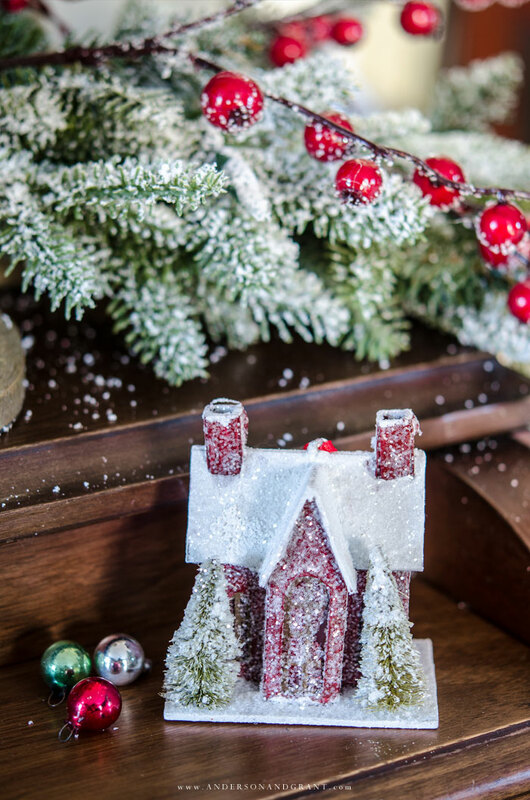 I also tucked in this little Putz house ornament continuing with the vintage inspired theme. 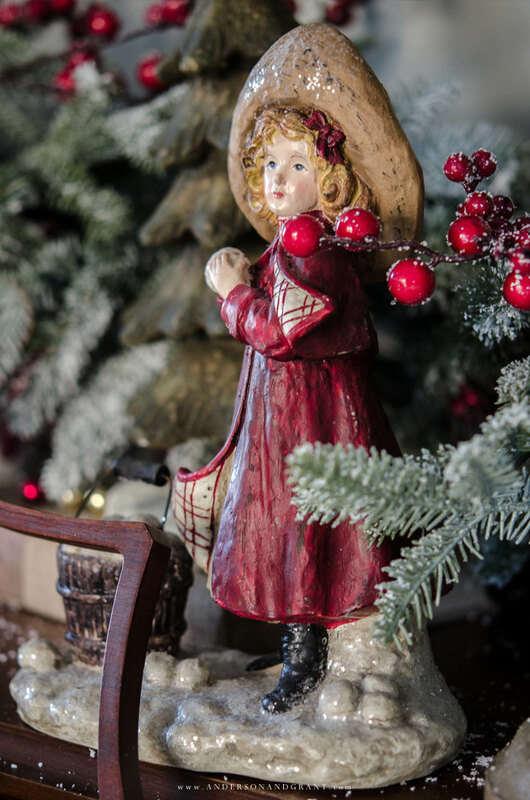 Just because it is an ornament doesn't mean that it has to hang on a tree. I also love seeing little things like these displayed under a cloche. Placing anything under glass makes it seem more important. 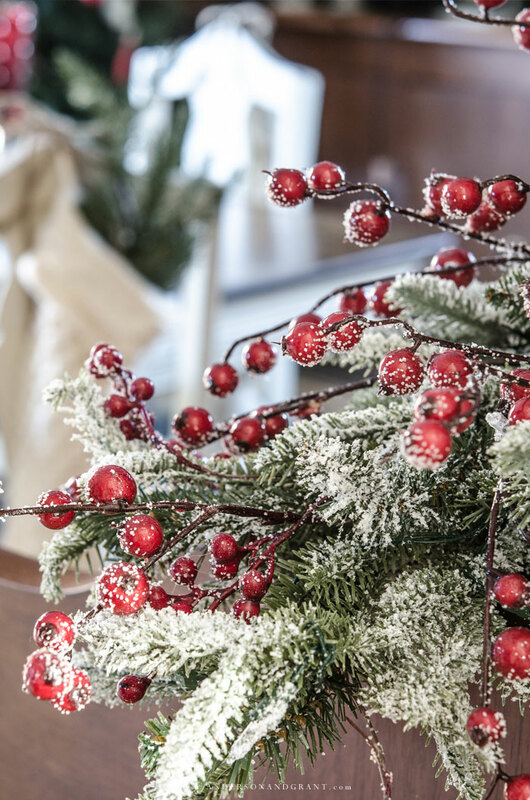 To tie everything together and continue with my snowy look, I draped a frosted Fraser Fir garland with red berries through the display. Greenery really is the final touch to make a vignette look complete. 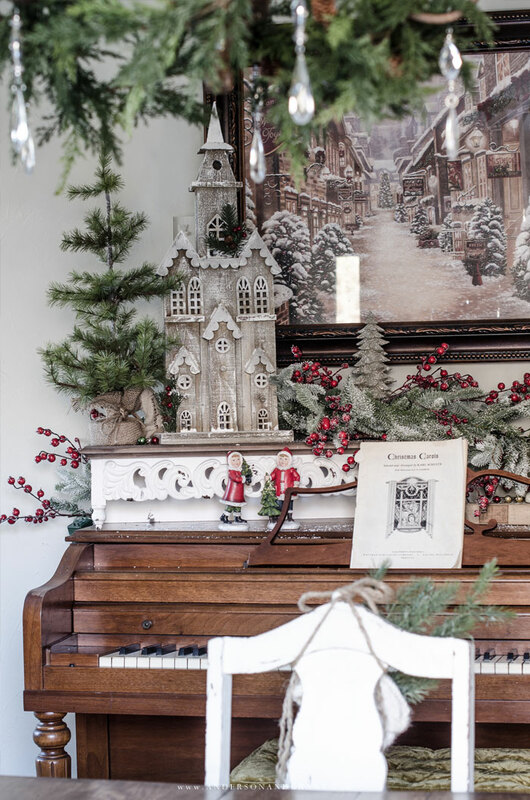 Rather than lay the garland straight across the top of the piano, I like to tuck it in around my favorite items and really wind it through the display. Any time you are using something like this that has been flocked with snow, you are going to loose some of the flocking. 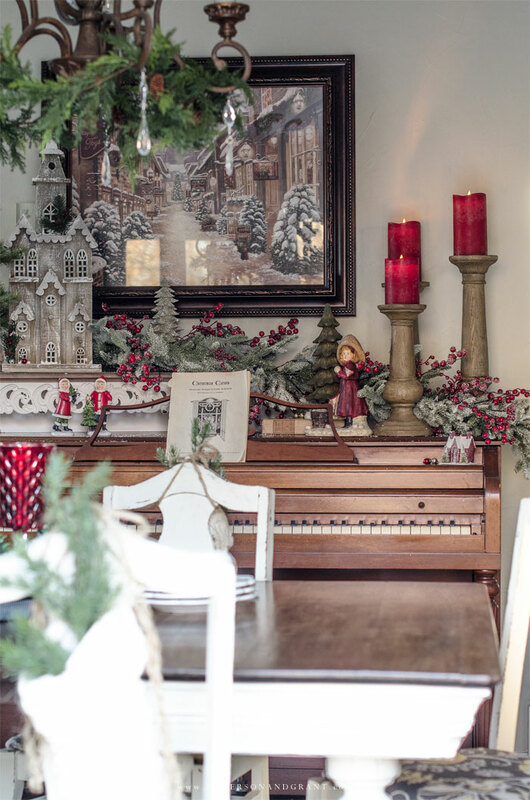 I chose to leave the dusting that fell off of the garland on the piano because it really just coordinated with my look. Thank you so much for stopping by today. It doesn't matter whether you shop from Balsam Hill, Target, or the Dollar Store. Or maybe you just use what you already have year after year. 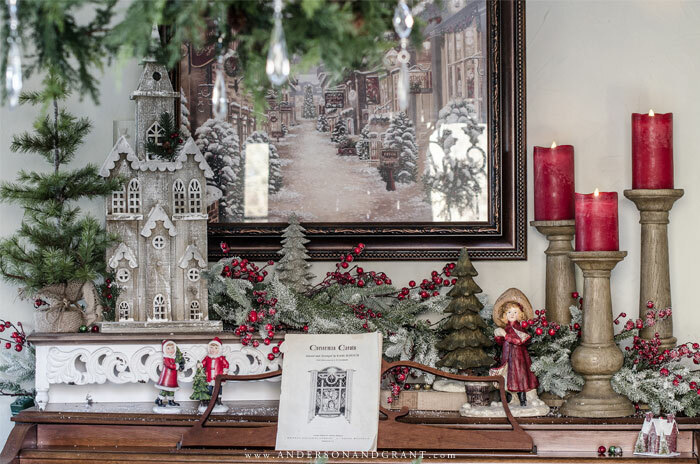 What is important is that you fill your home at Christmas with things (and people) you love and that remind you of what the season is all about. 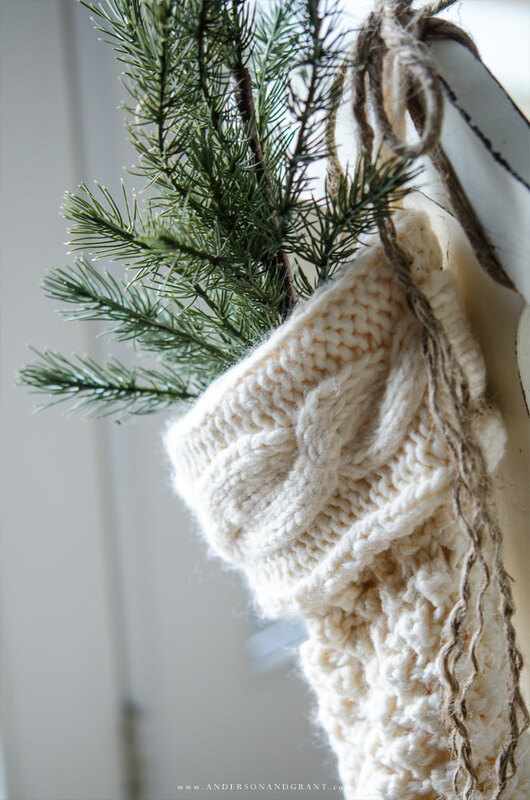 Find unique ways to change things up and you will have a fresh look each holiday season. 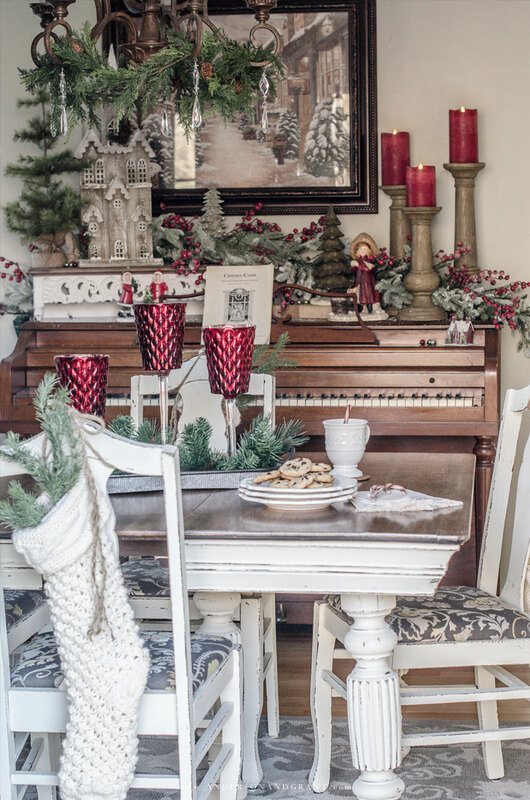 I hope that this post has given you a few ideas for spreading a festive touch through your own space this year. 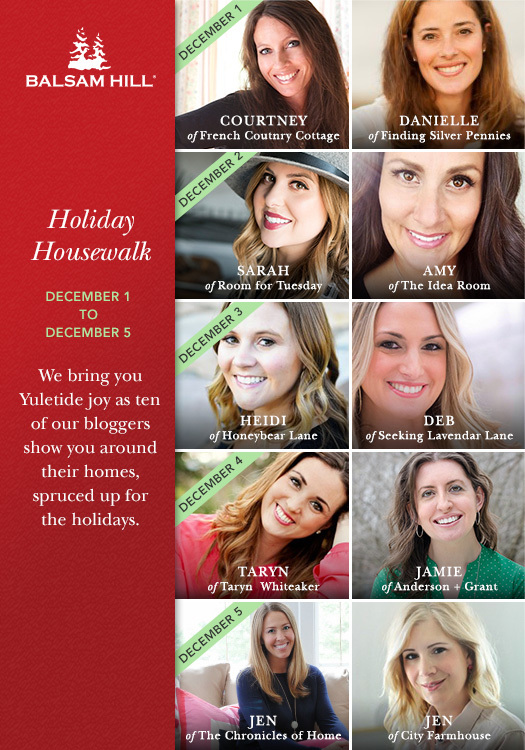 BE SURE TO VISIT THESE OTHER LADIES IN THE HOLIDAY HOUSEWALK!